On Monday 14th April I made the call that I had been a little apprehensive to make, I rang the ward to see if there was a bed available for my octreotide trial. The answer was a resounding yes and then the nerves kicked in big time, up until then I had been relatively calm. The disasters of my stay will be fodder for a future blog post (s) when I feel less like I’ve had a bus and then several cars run over me. However for those of you interested in the results I thought I would do a quick update today (Wednesday 16th April) ready to be published on Thursday 17th April 2014. I managed to get home a little after 24 hours on the ward and by this point I had tolerated three injections of 25mcg, one of which I had done myself. The injections are subcutaneous so theres no finding a vein which would be a complete disaster for me. If a hospital phlebotomist has problems and they take blood all day everyday theres no hope for an amateur like me! The injections need to be done in conjunction with a meal as my symptoms are at their worst in the two hours after I eat. The first injection stung a little, the needle going in doesn’t hurt its the octreotide going in that does. However I’ve had some great advice from fellow users courtesy of facebook and know that it is best to get the dose up to room temperature before injecting it. With the first injection given to me on Monday evening, I still had a little episode after eating where I went to sleep and then woke up confused thinking I was back at my parents house in a completely different city. The confusion didn’t last long and I came out of it pretty quickly. My second injection took place at around 7am on Tuesday morning and I had a few slices of toast to see how my body coped with another carbohydrate heavy meal ( it really doesn’t matter what I eat, protein or carbs I will crash all the same but carbs are the worst). After 45 minutes I had some tachycardia but it wasn’t as forceful as normal (by forceful I mean it didn’t feel like my heart was trying to break out of my chest. That’s how it normally feels after I’ve eaten) I did have a little sleep of 20 minutes but I had, had such an awful nights sleep that at some point during the day a nap would have been called for. At around 930am my consultant popped in to find out how I was doing. I really don’t like being in hospital and the usual confident young(ish) woman that he has got to know over the last few years had vanished. Before him was a quivering wreck that was close to tears with the stress of it all. Hospitals / doctors / anything remotely medical makes me extremely anxious these days due to horrific past experiences, so I think he was genuinely shocked at the state I was in. Having told me the day before that I was going to be kept in all week and I had managed to bargain him down to Wednesday morning, he decided that I could go home later on that day provided I suffered no side effects from lunch times injection and that I did the injection myself! At around 13:30 I did my very first injection, having been talked through it by the nurse. All went well until she forgot to tell me that the skin that I had pinched to put the injection in, had to be let go of before removing the needle – otherwise what you have injected oozes out! I haven’t made that mistake again! I’ve suffered no hideous side effects from the octreotide. All I have experienced so far is a strange metallic / salty taste around 20 minutes after injecting, a strange burning feeling in my mouth and throat, a minuscule amount of nausea and an empty feeling in my stomach. None of these symptoms are so dire that it would want to make me discontinue the medication. Even on the tiny dose that I have taken there have been improvements. Today I’ve had no tachycardia after eating, on checking my blood pressure it was a healthy 115/80 with a pulse of 68. I never have a normal blood pressure unless I am in a lot of pain or I am incredibly stressed and my pulse never goes below 80 beats per minute. It usually resides in the 90 -100 zone, so a low pulse rate is incredible. I also took a shower whilst the octreotide was still in my system ( it leaves the body after 90 minutes) and I had no blood pooling in my legs. Normally when I shower they are a livid pulsating purple colour and at the same time my internal organs feel like they are falling out of my body onto the shower tray beneath me. However I need to stress this isn’t a cure, for want of a better word my autonomic nervous system is screwed and my condition is worsening. I will only improve whilst the drug is active in my system. There is a slow release injectable version of this drug but I am in the trial phase at the moment and that won’t be considered until my consultant and I are sure that the drug is improving my condition. As soon as the drug wears off my heart rate soars and my blood pressure plummets. For the 90 minutes whilst its working, so far I haven’t noticed any change in energy levels but then I have a hospital visit to get over! So the injection currently improves my post prandial hypotension and tachycardia for 90 minutes three times a day. The rest of the time I still have tachycardia, orthostatic intolerance and painful joints due to the Ehlers Danlos Syndrome. I know that this is a much shorter post than normal for me but I am exhausted! 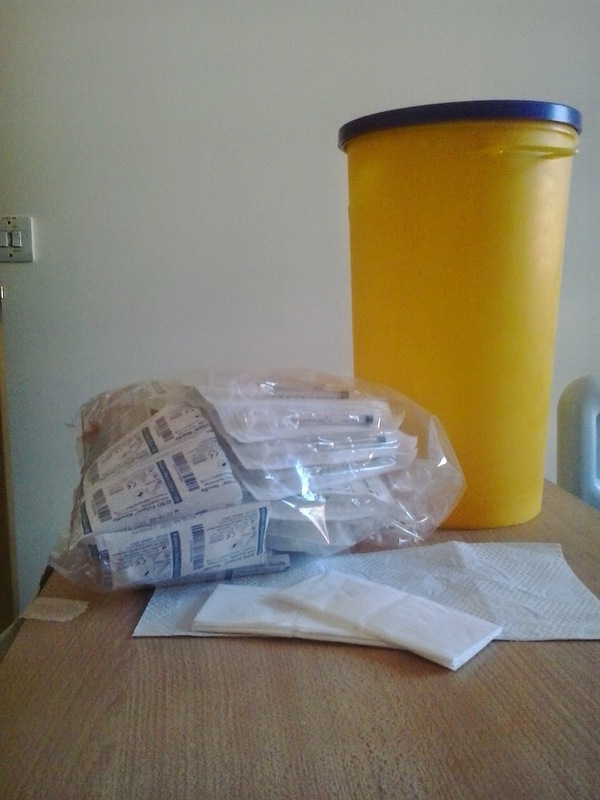 This is the “sharps bin” and pack of syringes I have taken home with me! The bin is enormous and we are now trying to work out storage solutions for all my syringes so the house doesn’t look quite so goulish! I am thinking about getting some nice fabric and making a drawstring type bag to cover the outside of the sharps bin!